This one's a best-seller for a reason! 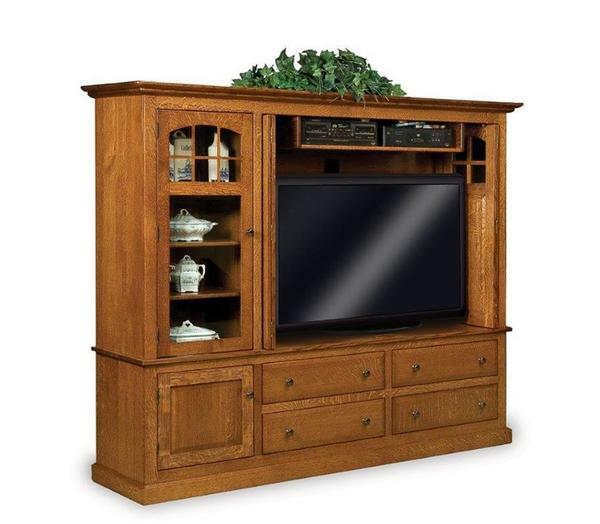 Handcrafted by dedicated Amish woodworkers, this solid wood entertainment center brings together the best in traditional design and modern convenience to create an entertainment center that offers unbeatable form and irresistible function. With a wide variety of customizable storage options and a dedicated curio cabinet, the Modern Mission Entertainment Center has something to add to every home. Use the menus above to make your Modern Mission a piece that exactly matches your vision. We're happy to send you a selection of wood and stain samples to help give you a stronger idea of exactly what our pieces look like - just give us a call or an email and we'll get you set up. Every element of this piece is handcrafted right here in the United States by dedicated, seasoned woodworkers, assuring you that nothing but the best of home-grown quality and attention to detail will go into your finished piece. We'd love to answer any questions you might have, too - please don't hesitate to get in touch if there's anything more we can do for you. Weight: Approx. 150 lbs. Comes in two pieces, base and top. Shown in Quarter Sawn White Oak with Michaels cherry.